The Tribeca Film Festival has announced Spider-Man 3, directed by Sam Raimi, will have its U.S. Premiere at the 2007 Tribeca Film Festival, presented by American Express. Spider-Man 3, a Columbia Pictures film which opens in theaters worldwide on May 4, will celebrate the first-ever star-studded gala premiere in Queens, Peter Parker’s hometown. Stars of the film, including Tobey Maguire and Kirsten Dunst, will land in New York, their final destination after an eight-city international tour and join a crowd of 3,000 people at the UA Kaufman Astoria 14 in downtown Astoria on Monday, April 30th. With a marching band leading the stars to the “black carpet” and local fans lining the streets, this spectacular premiere will be one of several events throughout the festival, celebrating “Spider-Man Week in NYC,” presented by Columbia Pictures and NYC & Company. For more information on Spider-Man Week NYC activities, please visit Spider-ManWeekNYC.com. 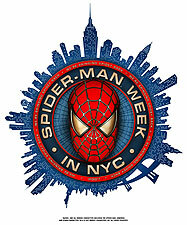 In addition to the premiere and citywide screenings, the Festival will host Spider-Man Saga Screenings. These will be the best way to prepare for the latest chapter in the life, loves, and adventures of Peter Parker. Night owls will enjoy the midnight screenings of both Spider-Man and Spider-Man 2 on Tuesday, May 1st and Wednesday, May 2nd, respectively, while die-hard fans can start their weekends early with a back-to-back doubleheader on Thursday, May 3rd before heading out to the very first screenings of the new film on Friday, May 4th. These screenings will all feature an exclusive sneak peek of Spider-Man 3 and other fun surprises. In Spider-Man 3, based on the legendary Marvel Comics series, Peter Parker has finally managed to strike a balance between his devotion to M.J. and his duties as a superhero. But there is a storm brewing on the horizon. When his suit suddenly changes, turning jet-black and enhancing his powers, it transforms Peter as well. Under the influence of the suit, Peter’s pride and overconfidence take hold and he begins to neglect the ones he cares about the most. As two of the most-feared villains yet, Sandman and Venom, gather unparalleled power and a thirst for retribution, Spider-Man’s greatest battle is the one within himself – he will need to rediscover who he is and what makes him the hero people love. Columbia Pictures Presents A Marvel Studios/Laura Ziskin Production Spider-Man 3 starring Tobey Maguire, Kirsten Dunst, James Franco, Thomas Haden Church, Topher Grace, Bryce Dallas Howard, James Cromwell, Rosemary Harris, and J.K. Simmons. The film is directed by Sam Raimi. The screenplay is by Sam Raimi & Ivan Raimi and Alvin Sargent and the screen story by Sam Raimi & Ivan Raimi; based on the Marvel Comic Book by Stan Lee and Steve Ditko. The producers are Laura Ziskin, Avi Arad, and Grant Curtis. The executive producers are Stan Lee, Kevin Feige, and Joseph M. Caracciolo. Spider-Man 3 opens worldwide on May 4.